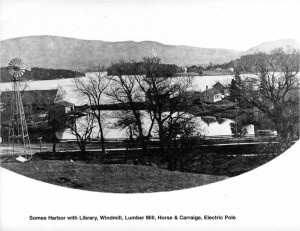 Somes Harbor with library, windmill, lumber mill, horse & carriage and electric pole. Abraham Somes was a fourth generation Somes in the United States when he sailed from Massachusetts to this area. In 1762 he established the first permanent settlement on Mount Desert Island. By the early 1800’s there were seven mills, five shipyards, four blacksmiths and two stores in Somesville. 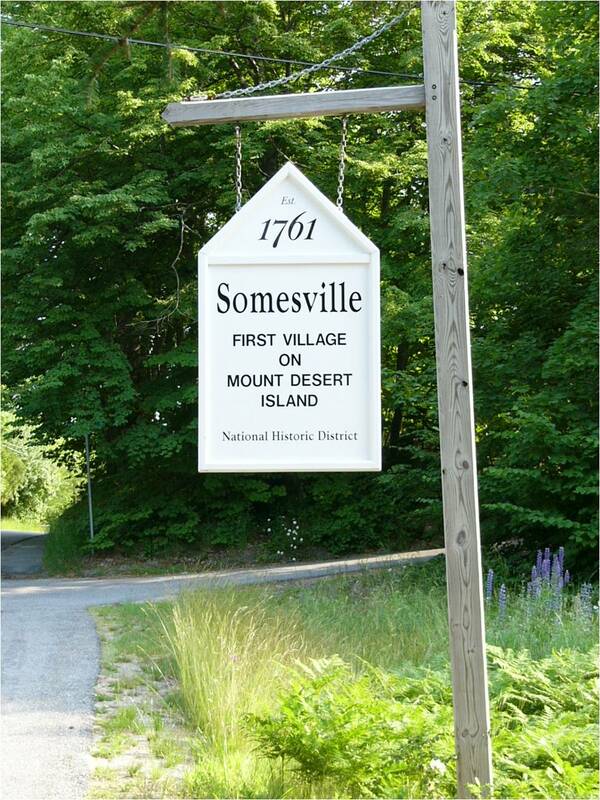 The Village of Somesville was a bustling town and was instrumental in having the Trenton Bridge built in 1836. It was the dominant town on MDI until 1907. Somes Pond is one of the natural treasures of historic Somesville. A relatively shallow pond (about 30ft at its deepest spot), Somes Pond encompasses approximately 104 acres (it qualifies as a Great Pond under State Law). The pond derives its waters from underground springs, and serves as a collection point for an extensive area of wetlands, streams, Ripple Pond and Long Pond. It empties into SomesHarbor via the Mill Brook. Generations of local residents have appreciated the Pond and its surrounding landscape for plentiful wildlife, clean waters, scenic beauty, recreational opportunities, and for its place in the history of Somesville. A direct descendent of Abraham Somes, Dr. Virginia Somes Sanderson, wanted to further preserve the natural beauty of the area and protect it from further development. In the fall of 1974 Dr. Sanderson conceived the idea of a permanent sanctuary on Somes Pond. The idea became a reality in 1985 with the formation of the Somes-Meynell Wildlife Sanctuary, and the transfer by Dr. Sanderson of 33 acres along the Pond to the Sanctuary. The Somes-Meynell Wildlife Sanctuary was incorporated for charitable, educational and scientific purposes; namely: (a) the preservation, maintenance, management and enhancement of the natural and historic values and habitats; (b) the care and protection of the wildlife of the Sanctuary and its environs; (c) the education, enlightenment, and enjoyment of the residents of Mount Desert Island and the Public of the values of ecology, conservation and natural history through Sanctuary activities and nature interpretation; and (d) conservation of the Somes Pond Watershed; wildlife habitats and natural resources (taken from the By-Laws of the Sanctuary, Article II, Purpose s). Through the vision and work of its trustees, staff, friends and neighbors the Somes-Meynell Wildlife Sanctuary has grown since its founding, now protecting and preserving approximately 230 acres in the Somes Pond Watershed. As increasing development and visitation places pressure on fragile natural systems within its watershed the Somes-Meynell Wildlife Sanctuary will need to remain diligent in its mission of education and conservation of this very special place.